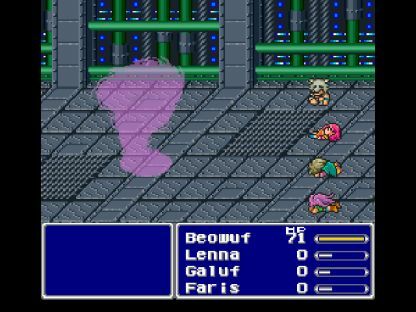 Just a few more solo games left to go before polishing off Final Fantasy 5. This time we're going to look at the Berserker class, one of the game's most difficult to use jobs. Berserkers are permanently under the Berserk status, as their name implies, granting them significantly more attack damage and immunity to several status ailments. However, this comes at a great cost: you cannot control Berserkers at all, and they will attack endlessly until one of two things happens: either the Berserker dies or all of the monsters die. Those are the only two possible outcomes to the battle. This makes the Berserker one of the most unruly and hardest to use classes in the whole game. They don't listen to orders from you, bub! In other words, this was going to be another major challenge. The Berserker does have a couple of advantages going for them. First of all, the Berserk status itself produces significantly more damage, increasing the Attack value of the character by 3/2. Notice that this is actually the Attack value, not the multiplier M, which is actually better because high monster Defense would be less effective at reducing damage. Secondly, the Berserk status does protect against the Charm/Confuse status effect, which is a pretty big deal for a solo game. Berserkers also have extremely high Strength, meaning that their damage increases quickly with their Level, and access to a nice selection of weapons. They are the only ones who can use axes, which produce random damage but do pierce armor and generally hit rather hard. Berserkers can also equip all of the "Heavy" set of armor and use shields, getting Aegis protection and physical Evade. So Berserkers are really good at killing stuff - that isn't the problem. This is not a low offense variant (thank goodness). The problem is that Berserkers are totally uncontrollable in battle. Think about what that means for a moment. You can't pick which target the Berserker attacks. You can never run away from battle. You can never swap weapons in battle. You can never use any items in battle, ever! Holy moley. Uhh... but at least the Berserker does a lot of damage when he does attack! This would not be easy. Beowulf had tremendous Strength and Vitality; he would be getting extra Attack multipliers very quickly with that 49 Strength, and Vitality of 52 (one less than the Monk class for highest in game) ensured a ton of health to play around with. However, his Agility was horribly low at only 16. That's the worst in the game out of all job classes by a very wide margin! The next-closest is the Summoner, with an Agility rating of 23 (24 on the Bartz character). This was immediately noticeable in monster encounters - normally your character can act before the monsters, but Beowulf was so slow that they invariably would get in the first strike. Letting the enemies hit first in pretty much every battle was a very serious handicap indeed. Finally, the Magic Power stat was also garbage, although this was totally useless because Beowulf could never use magic in any way, shape, or form. The slow Agility was what really bothered me! I noticed right away while playing Beowulf that I couldn't run away from battle. That's a shame, because otherwise you could power up the Chicken Knife and get an insanely powerful Berserker using it. But it appears as though that's not an option, and I didn't feel right about running away from battles to power it up before Beowulf changed classes. It felt like that would be a violation of the restrictions of this variant. I also noticed that Beowulf was particularly screwed from back attacks, as he would be stuck in the back row and could never change his position. Whoops! Never even thought about that. Another little restriction to deal with. On the plus side, Beowulf was dishing out massive damage even with nothing more than Faris' starting Dagger, which boded well for the future. Beowulf would have no choice but to slug his way through encounters with high damage, so at least he had a lot of it. Let me tell you, it was awfully strange doing a boss battle where I had no control over the outcome. I literally just sat there and watched the action. 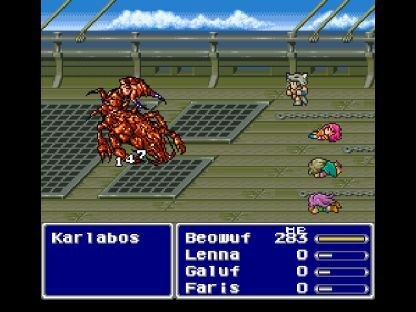 Anyway, this would have been really easy if I could have used Elixirs to heal after Karlabos used his Tailscrew move. As it was, Tailscrew was pretty much a death sentence for Beowulf, as one of the AI routines for Karlabos is a guaranteed Fight or Tentacle command. Get knocked down to critical, impossible to heal, and then get attacked and killed. It was also rather painful to have Beowulf take actions so much more slowly than Karlabos; the red lobster was significantly faster than my solo character, and thus would always have the chance to paralyze with Tentacle before Beowulf got to act. Nevertheless, when my berserker wasn't stunned he was definitely doing some awesome damage, and I knew it was only a matter of time before Beowulf would emerge victorious. I could run the encounters super fast with the emulator's fast forward, since I didn't even need to enter commands! After about a dozen tries Beowulf won the battle, actually only hitting the boss four times but rolling high on damage every time and apparently doing just enough to overcome Karlabos' 650 life. 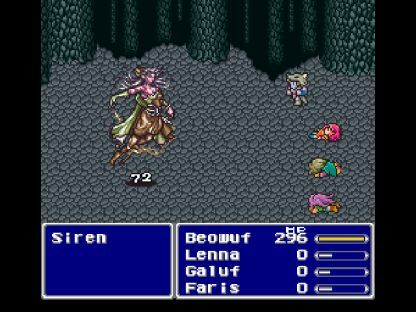 I was a bit worried about this encounter, as she can use some nasty buffs and debuffs. Well Beowulf got a little bit lucky and managed to avoid the one move that was really dangerous, Siren's Slow spell. I was rather amused when Siren opened the battle by Hasting herself, and then was so fast that she was able to get off a second move before Beowulf could react... which she used to cast Cure, despite taking no damage. Nice one. Anyway, Siren loses her Haste status when she changes forms, and it was the undead form that Beowulf started pounding on. Normally this form's 12 Defense means that you can't do much of anything physically, since the best weapon in the game at this point is the Broad Sword, which only has 15 Attack. However Beowulf ignored all of that, and his Berserk status boosted his base damage up to 21, allowing him to carve up even the undead form of Siren. You can see the 72 damage in the above picture, and he had one attack that rolled 96 damage. As someone who has done this battle many times, I was practically giddy - I've never seen that kind of physical damage against this boss before! And of course the human form of Siren has no Defense at all, so Beowulf could roll 170+ damage per swing there. Beowulf managed to win on my first try here, brute forcing his way past the encounter before his health ran out. Carwen village didn't have any new weapons on sale, but it did allow Beowulf to upgrade his armor from Leather to Bronze stuff (armor, helmet, and shield). I could also pick up 99 Potions for the first time, which was nice because I had nearly run out in the Ship Graveyard. Beowulf's new Bronze equipment made him even slower than before (equipment weight of 18), however it also made him almost immune to damage in random monster encounters. Enemies were doing a lot of single digit damage against him. Beowulf slugged his way through North Mountain without issue, and faced off against the bosses at the end. Magisa did not use her Drain, which was the one attack that worried me. I thought that Beowulf would probably die against Forza, and I would need to add a few more levels for extra health, but to my surprise Beowulf blocked several attacks with his Bronze Shield and won the damage race, finishing with about 50 HP remaining. The end of the battle was a true slugfest, two pure melee fighters going at one another until one of them was dead, no way for either one to heal themselves. Felt almost like a bad kung fu movie. 2) Follow Hit Determination for Physical Attacks steps (6.2.1). 4) Apply Row modifiers to M (6.5.2). 5) Apply Command modifiers to Attack, Defense and M (6.5.3). 6) Apply Double Grip modifier to M (6.5.4). 7) Apply Target Status Effect modifiers to Defense and M (physical) (6.5.11). 8) Apply Attacker Status Effect modifiers to Attack (physical) (6.5.12). 9) Damage = (Attack - Defense) * M. Max Damage = 9999. You can see in there how monster defensive gets slashed by 75%, which is why axes make great weapons against high Defense opponents. Axe damage is also highly variable, with the base damage amount varying from Attack * 0.5 to Attack * 1.5. For the Battle Axe, this meant an attack value anywhere from 11 to 34; in other words, some attacks would do fully triple as much damage as others. I found that Beowulf at this point in the game would generally do anywhere from 130 to 400 damage on each swing, definitely unpredictable. Generally high damage though, at least on average. 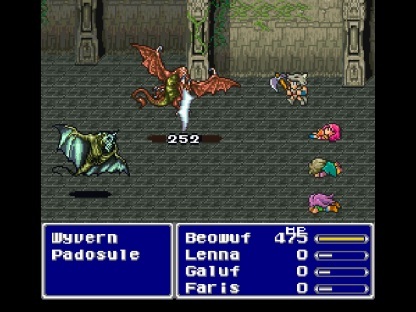 As for the actual Worus Tower dungeon, the enemies inside usually died in one hit, and Galura cannot harm a character wearing all the "Heavy" armor. The toughest fight came when Beowulf was turned into a toad via FrogSong, because I had no way to change him back! That was unexpected... Beowulf did win that fight, doing 20 damage per attack as a little froggy. Karnak offered an upgrade to a full Mythril set of equipment: helmet, shield, armor, and gauntlets. Beowulf already had the Mythril helmet from his battle against Magisa and Forza, but I happily picked up all the rest. There were also two new weapons on sale here, the (you guessed it) Mythril Dagger and Mythril Hammer. I realized in the Steamship that I would be better off using the dagger most of the time; even though it did less damage on average, it was considerably more reliable since the hammer only had an 80% chance to hit. Besides, any attack against a monster in the front row would kill them anyway. I didn't need more overkill damage, I needed a weapon that didn't whiff 20% of the time. Berserkers as a class are so associated with axes, it's easy to forget sometimes that they can also use the standard daggers, which will also get the same 1.5x damage benefit from being Berserked. I would keep this in mind for the future. LiquidFlame was the first boss battle that Beowulf couldn't simply slug his way through on pure damage output. This is normally a pretty easy boss battle, once you understand how the three forms work and can take the time to heal up during the not-dangerous Tornado form. Of course, Beowulf couldn't ever use any healing items, and I couldn't tell him to stop and wait for the Tornado form to run itself out of magic points. This was going to be interesting... I quickly found that the dangerous form in this fight was the Human one. Every time that you deal damage to this form, it responds with "Flame", a fire attack that deals 1/4 of your max health in damage. The Human form also has 1/3 odds to use Flame on its normal actions. Now normally the percentage based attacks are some of the least dangerous for variant runs, as they will never kill you at full health regardless of level or equipment. However, this was not the case for Beowulf, as he lacked any healing ability whatsoever. Four "Flame" attacks would take away 1/4 of his max health, and would mean instant death! The Hand form was pretty tame, as its physical attacks would always do 0 damage against Beowulf's heavy armor. When damaged, it would respond with Fire 2, which would do about 300 damage to Beowulf. Finally, while the Tornado form couldn't harm Beowulf, its use of self-healing would effectively add to LiquidFlame's maximum health, prolonging the battle and meaning more dangerous form shifts. What I needed was for Beowulf to avoid the Human form as much as possible, having LiquidFlame bounce back and forth between the Hand and Tornado forms as much as possible. That Flame attack was deadly! I reached LiquidFlame for the first time around Level 20. It was very obvious that Beowulf wasn't strong enough to beat the boss at this point, and that he would require more levels to add damage and (perhaps more importantly) more maximum health. So this became a mathematical problem, how many attack multipliers I would need in order to have a decent chance of beating the boss. LiquidFlame has 3000 HP. I found in some early test runs that Beowulf could expect to get about five attacks off before dying, a few more than that if he was extremely lucky. So I decided to go in with the expectation of getting six attacks, possibly having more but it wasn't something I could count on. I needed to average about 600 damage to get the kill, factoring in that LiquidFlame would heal back some damage in the Tornado form. Which weapon to use, the Mythril Dagger or the Mythril Hammer? LiquidFlame has 0 Defense, so the piercing property of axes was not a factor. The dagger had a base attack of 23, which became 36 base attack on average after getting the Berserk bonus and the slight extra random damage on combat rolls. The Mythril Hammer could do anywhere from 14-42 base damage (average of 28), which was magnified to 21-63 (average 42) with the Berserk bonus. So the hammer definitely did more damage, even if it was also very random. But wait! The hammer also had only 80% chance to hit, while the dagger had 100% chance. That would make it sound like the dagger was the beter choice, EXCEPT that the danger from LiquidFlame came from the form shifts (getting hit with Flame and Fire 2), and missing would not trigger form shifts. Therefore, I actually did want the hammer for its greater damage potential, even if it would miss a lot of the time. Misses didn't matter at all against the Hand form, and were only mildly irritating against the Tornado form (they were pretty bad against the Human form though!) Anyway, with the hammer I had an average damage of 42 per attack multiplier. To get about 600 damage per attack, Beowulf would need 600 / 42 = 14 attack multipliers on average. I worked that out and Beowulf would have that at Level 32 [32 Level * 49 Strength / 128 = 12 + 2 = 14 = M) I would shoot for Level 32 with Beowulf. This actually wasn't as close as it looks; if the Tornado form shifted into the Hand form, I would have had another guaranteed chance to hit LiquidFlame without taking any more damage. Had the boss gone to the Human form though, Beowulf likely would have died without getting off another strike. Anyway, the first real roadblock boss was past and I was feeling pretty good about Beowulf. He was drastically overleveled even for a solo, but that was to be expected. I knew I would have to be overleveled throughout the whole journey from this part forward to survive. The Ancient Library was surprisingly easy, perhaps because Beowulf was a higher level than most solo characters. I decided to go ahead and try the Ifrit battle, which was another straight-up slugfest. 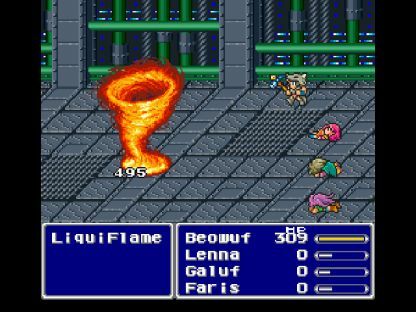 Ifrit's worst attack was the same "Flame" attack used by LiquidFlame, doing 1/4 of max health in damage. Four appearances meant death. Ifrit also used Fire 2 quite commonly, which did about 300 damage per casting. Ifrit's physical attacks were what I wanted to see, as Beowulf had 62.5% physical Evade from Guardian Dagger + Mythril Shield + Elf Cape. With each one of Beowulf's attacks dealing 600+ damage, I needed five attacks to defeat the boss. 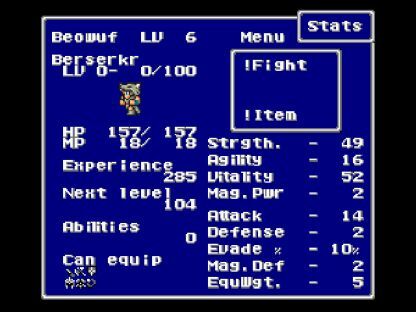 On my first attempt, Beowulf got in four hits along with one missed attack before dying. 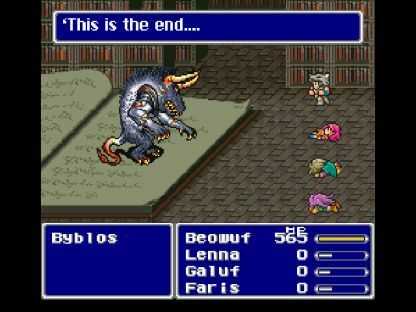 Well that seemed promising, and indeed on the second try he defeated Ifrit. I went on and decided to try Byblos as well, since there was a save point in the dungeon. Byblos didn't seem quite as bad for Beowulf as other solos, since he had high damage capacity and would be able to get past Drain at the end of the fight by out damaging it. Beowulf's Berserk status would also make him immune to the Charm spell. I needed to avoid Sonic Wave's de-leveling and try to avoid Slow status as long as possible. Let me tell you, I was not expecting that. Byblos could have wrecked Beowulf pretty badly if he had hit on his Sonic Wave and Armor buffs. But the bad stuff never appeared, and so I won rather easily, not even having to worry about Drain. Now Beowulf was right back on the normal leveling track for a solo character, at least temporarily. Still at Level 32 exiting the Ancient Library. 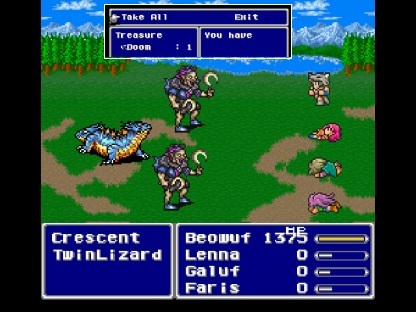 These "Crescent" pirate enemies have the chance to drop the Doom Axe weapon, which was the best item available to Beowulf for quite some time to come. I've used before in other variants, as the Doom Axe has a 33% chance to cast the spell Doom on a successful hit, which can be used to kill most random opponents and a few bosses. For Beowulf, the Doom Axe was more useful as the weapon with the highest Attack value currently available for his class. With a base Attack of 43, the Doom Axe has an actual Attack value of 21-64 after the axe randomness factor gets included. 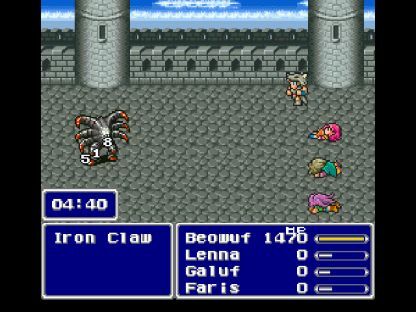 This Attack value was then further multiplied by 1.5 since Beowulf was permanently Berserked, for a final Attack value of 31-96. That was a pretty humongous range for possible damage, and it made accurate planning very difficult. This was further complicated by the Doom Axe having only 85% odds to hit the target (before factoring in enemy Evade percentage), so there was always a chance that Beowulf would swing and miss. Nevertheless, on the rare occasions when Beowulf would swing and hit the max damage roll, the result was pretty spectacular. Attack value of 96 was almost as good as having the Hardened Dagger (attack 99) halfway through the first world! Unfortunately I was about to hit the bane of all Berserker variants, the challenge that brought an end to innumerable attempts at this quest. The terror in the night, the Achilles hell, the greatest fear of a character who can never be controlled in battle. Still, I wasn't too concerned with this battle initially. The Sandworm only has 3000 HP, and I had already seen how much damage that Beowulf was dishing out with his Doom Axe. With his current Level of 35, Beowulf was averaging about 950 damage per attack (although it could range anywhere from 500-1400 damage in practice!) Assuming slightly better than average luck on the damage rolls, all I had to do was hit the Sandworm three times and it would be dead. Even with the Holes in play, hitting the Sandworm at 1/3 odds shouldn't have been all that tough. This won't be easy, but I should be able to get it finished without anything too crazy. That's what the math suggests, right? Wait, why is Beowulf doing so little damage? And why is he hitting the Holes so often? I know how statistics work, and I know that getting a long run of misses is not unexpected, but something is still not right here. Beowulf isn't hitting the Sandworm anywhere close to 1/3 of the time. What is going on here?!? I did a little more investigating and found out the dirty little secrets behind this battle. First of all, the Sandworm is always classified as being in the back row when taking physical damage. It's actually not written this way in the code, only the back Hole is supposed to take half damage, but in practice they all function as being in the back at all times. Obviously this was really bad for a Berserker, since all of Beowulf's damage was physical and ended up getting cut in half. Remember how I expected to be doing roughly 1000 damage per attack? Beowulf was doing 500 per attack instead. Big difference. Secondly, despite every visual indicator on the battle screen, there are actually not three Holes written in the code. There are actually *SIX* Holes present in this fight! That's how it's written in the Algorithm Guide, three Holes and then three possible positions for the Sandworm. I'm sure that this was written this way for coding reasons, but it was an absolute disaster for the Berserker, as all six of those possible locations were randomly picked when Beowulf went to attack. And 5/6 of them would result in him hitting nothing but air, then getting a Demi counterattack in the face. Therefore Beowulf was doing half the damage I expected, and hitting on only 1/6 of his attacks instead of 1/3 of them. Keep in mind too that Beowulf would also miss 15% of all attacks when using the Doom Axe, further complicating the picture. Even assuming that Beowulf rolled in the upper end on his highly random damage, and assuming that he hit on his attacks when he picked the correct target, he would have to hit 5-6 times in order to win the battle. What are the odds of getting 6 hits at 1/6 odds before dying? Ummm, not very good, my friends. Not very good. It very quickly become obvious that Beowulf was nowhere even close to winning this battle. I struggled mightily to deal even 1000 damage, much less 3000 damage! I realized that I had to get the number of successful hits needed to kill the Sandworm down to a more manageable number. Five or six successful hits were completely out of the question; there was no chance that Beowulf would ever survive that long. Four hits might be doable, maybe, if the damage rolls were high enough. Three hits would cinch it, but that would necessitate averaging 1000 damage per hit, which was fully double the damage Beowulf was doing at his current level. I tried to figure out what level Beowulf would need to be to average 750 damage per hit, and have a realistic chance of killing the Sandworm in four hits. With an average Attack of 64, and working with the standard damage formula for axes [Strength * Level / 128 = M], I figured out that I needed to reach Level 57 to have a decent chance of winning. Level 57. Beowulf was currently Level 35. Many hours of powerleveling later, I came back for another shot at the Sandworm. The one good thing about the Berserker class is that leveling is easier than any other solo job. There's no need to input commands or do much of anything. Simply hold down the Fast Forward key and let the Berserker mow down everything in his path, which the class is quite good at doing in most random encounters. (Side note: don't ever try this variant unless you are playing on an emulator. Some kind of Fast Forward option isn't a convenience, it's a necessity.) 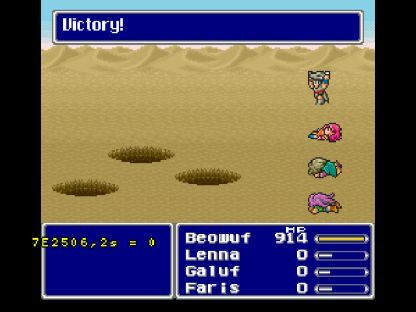 Anyway, I wanted to see how much progress I was making against the Sandworm, so I ran tests periodically to see how close Beowulf was getting to victory. I made my first 100 attempts at the battle at Level 42. This was probably more wishful thinking that anything else, and Beowulf never managed to get anywhere close to winning. OK, obviously needed more levels there. At Level 47, Beowulf gained another attack multiplier, and I tried again. I took inspiration from some of T-Hawk's solo reports and turned on a little tracking cheat that told me how much HP the Sandworm had left - this way it would be displayed on screen, and I wouldn't have to track it manually. Since I couldn't control the action in any way, this had no effect on the gameplay whatsoever, and it let me start keeping statistics on how my attempts were going in an Excel spreadsheet. I ran another 150 attempts at the battle at Level 47, experimenting with 50 of them using the Guardian dagger and 100 of them using the Doom Axe. The individual battle results were wildly divergent between the two weapons, but the end results were the same: both weapons topped out at 1300 HP remaining on the Sandworm. Hmmm, still not that close. I resolved to keep testing both weapons further. I tried against at Level 52, when Beowulf picked up another attack multiplier. This resulted in my furthest penetration yet, getting the Sandworm down to just 525 HP remaining. That was within a single attack of victory, but 525 HP remaining seemed to be the limit for the moment. Beowulf died with exactly 525 HP remaining twice, and died three more times with 943 HP remaining. In other words, these battles are not perfectly random - the same results were clearly popping up multiple times. T-Hawk correctly raised the point that there might not even be an RNG sequence in which victory was possible, since there are only so many possible seeds. If the RNG only had 256 seeds (stored as an 8 bit number), there could simply be no starting value where victory could be won. Talk about a discouraging prospect! Still, I was making some progress here. 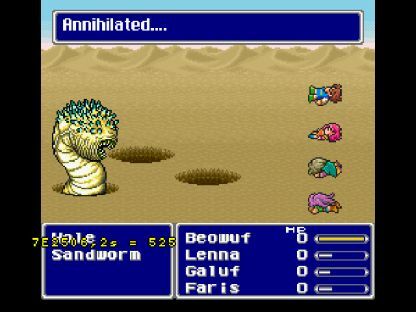 On my first 250 attempts at the Sandworm, Beowulf could never get more than three hits before dying - his level apparently just wasn't high enough to survive that long. I had gotten four hits on a bare minimum of my recent attempts: 6 times out of 150! Four percent of the time! This wasn't tedious at all! Now Beowulf needed to roll more damage on those hits, or somehow survive long enough to get a fifth hit. Either way, I needed more levels. The Level 57 trials were extremely disappointing. Despite another 150 attempts at the Sandworm (bringing my total to well over 500 battles! ), I still couldn't crack much beyond the 1000 HP mark. I actually did worse at Level 57 than I had done at Level 52! This was especially frustrating because the numbers had suggested I could potentially win here, only the RNG simply wasn't giving me any luck. Whatever the random seeds were, I wasn't getting ones that matched up with success for Beowulf. To give you a further idea of the futility of these attempts, Beowulf failed to inflict even a single point of damage on 76 of the 150 attempts. More than half of them yielded no result at all! After fighting the full 150 attempts with no success, I had no choice but to try against at a higher level. Even if it were theoretically possible, there was a limit to how much time I was willing to spend ramming my head into this particular wall before going back for some more powerleveling. I went back against at Level 62. Beowulf was now getting an attack multiplier of M = 13 (it would be M = 26, but that gets cut in half for back row status), for average damage of 832 per attack, or 416-1248 with the random axe formula. I would likely be able to win with four successful hits, and could potentially get a victory with three very high damage hits. Five hits would essentially guarantee victory, if Beowulf could live that long. Right away I saw more success at this higher level. 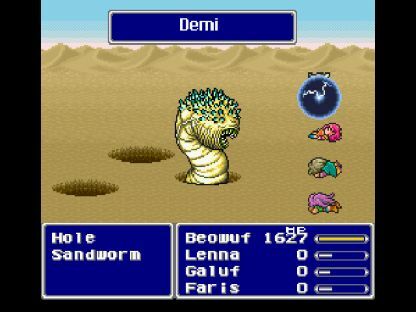 Many of the Sandworm's Demi spells were missing Beowulf - normally Demi has 99% odds to hit successfully, but since Beowulf's level was MUCH higher than the boss (Level 62 to Level 18), the odds dropped all the way down to 55%. This meant that Beowulf survived longer in each attempt, giving him more chances to land additional hits. I reached 426 HP twice, then got all the way down to 335 HP remaining. Getting really close now! Rolling slightly higher on damage or surviving to get that fifth hit would give Beowulf the breakthrough he needed. 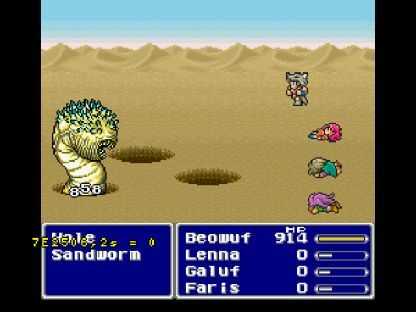 Beowulf landed four high-damage attacks, and suddenly the Sandworm's HP gauge had dropped down to 0. The boss is dead in that screenshot, he just doesn't know it yet. I sat and stared at the victory screen for long minutes on end, savoring the victory that had been so long in coming. Beowulf actually won the fight with quite a bit of health remaining; he could have eaten several more Demi spells without being in the true danger zone. In the end though, it was still a somewhat hollow victory. Folks, as much as I would like to claim that I did something witty or clever here, it really was all about powerleveling and running endless repetitions until the boss finally croaked. A trained monkey could probably pull this off too. Fight a ton of random battles until reaching an absurdly high level, then win without doing anything in the actual boss fight. Unfortunately, that's really all there is to most of the Berserker class. There's a reason why I saved this one until the end! 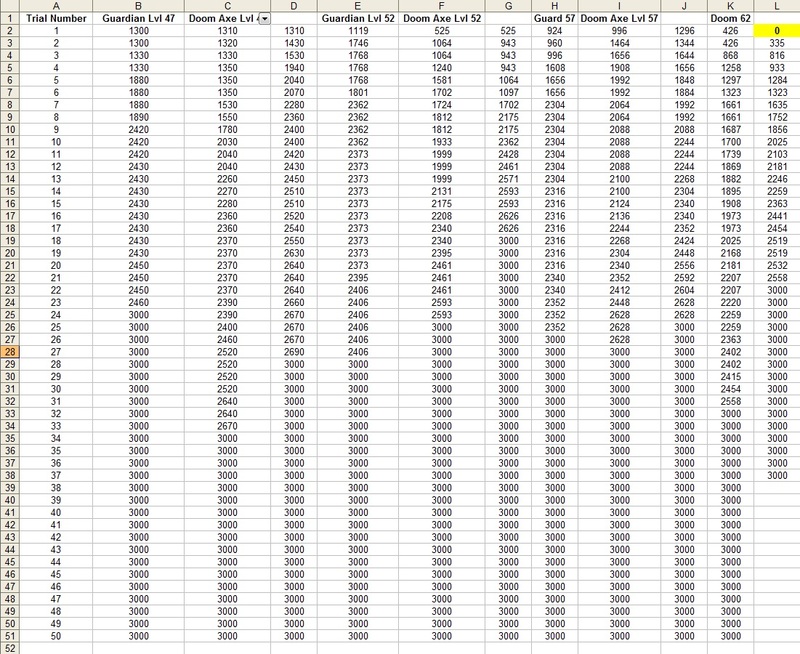 Here's a screenshot of my Excel file, entitled "Berserker Sandworm". I didn't record the first 100 attempts at the boss, but the other 537 are all listed there. I grouped them in sets of 50 each, then sorted them by the amount of health remaining on the boss. This table shows how close I came to victory with each group of trial runs. The huge clumps of 3000s at the bottom represent all the times that Beowulf died without inflicting any damage at all. (That was a lot of the time!) I tried both the Guardian dagger and the Doom Axe, eventually having more success with the greater overall damage of the axe. I like displaying this stuff in table form, as reading numbers doesn't always convey the scope of how many repetitions this took. It's one thing to read the number "637 attempts", another thing to see that displayed in visual form. I snapped this dialogue picture that Cid and Mid provide right after defeating the Sandworm. Oh, you mean there's more to this game? 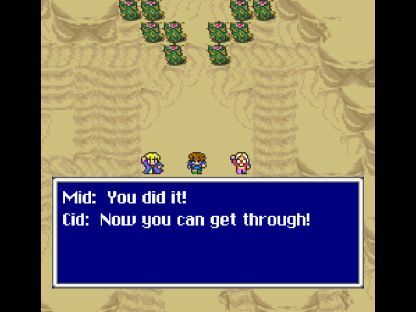 Final Fantasy 5 isn't comprised of endless grinding and bashing away at that horrible boss? I GET TO DO SOMETHING ELSE NOW?!?! Hooray!! !